Tree Planting: Mission Accomplished on May 13! In conjunction with the Casey Tree Foundation and the newly reorganized group, West End Dogs, the Friends of Francis Field (FFF) participated in the planting of 43 new trees on the periphery of the playing field on Saturday, May 13. Each organization, FFF and West End Dogs, was given 15 reserved volunteer slots for the planting. 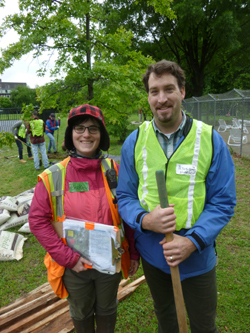 Casey Trees provided about 30 other "green vest" volunteers, as well as their "red vest" team leaders who were experienced tree planters. They worked in teams, as shown in the photograph above, taken at the south end of the field. 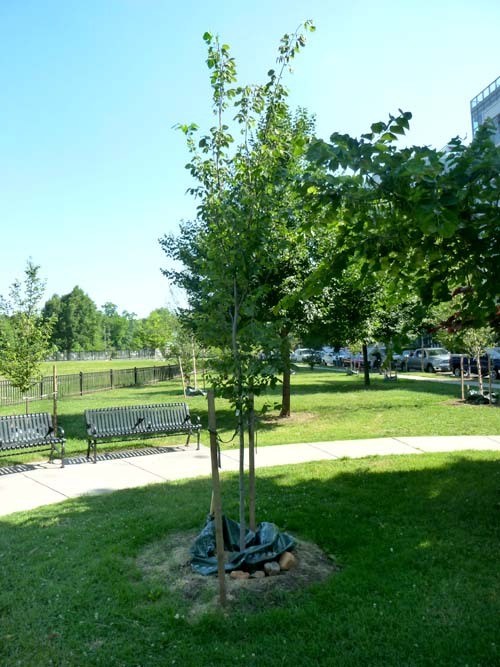 One goal of the planting was to provide trees to shade the new Francis Dog Park, which was constructed and opened in the fall of 2015. Another goal was to make the passive recreation areas that surround the playing field more park-like. Mayor Muriel Bowser was on hand to welcome the volunteers, at the invitation of Advisory Neighborhood Commissioner Rebecca Coder. 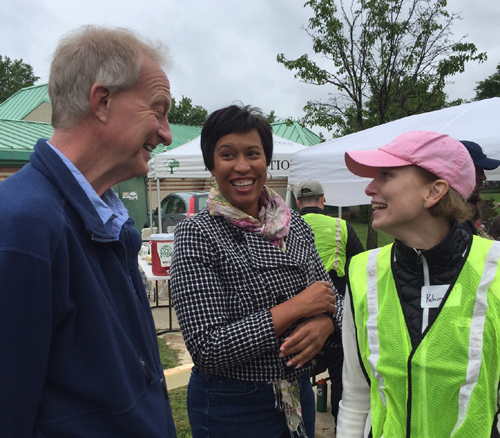 Also attending was Ward 2 District Councilmember Jack Evans. They are shown in the photo at left, taken at the north end of the field, near Francis Swimming Pool. The tree planting was the first phase of a three-part public-private partnership to improve the public field with private funding. FFF entered into the agreement with the Department of Parks and Recreation (DPR) in March of this year.1 Grass planting began in June and an irrigation study is also underway. For the tree planting, Casey Trees donated all of the trees, the tools, and the expertise. 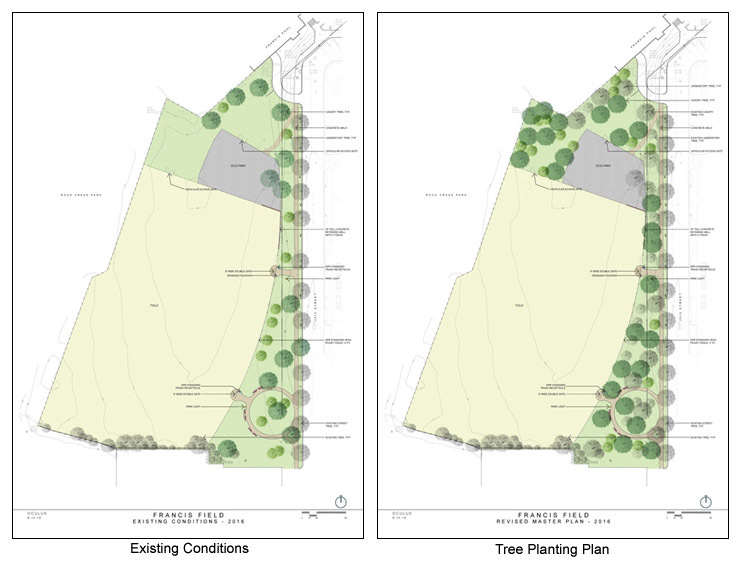 FFF provided a professional landscape architecture plan to update the 2009 master plan for Francis Field. West End Dogs was the project organizer, and coordinated the food—breakfast and lunch—for the volunteers. Eleven varieties of trees were planted: canopy trees for shade, and ornamental trees for landscaping and beautification. Casey Tree's arborist, Becky Schwartz, and DPR's landscape architect, Peter Nohrden, selected the species to fit the landscape plan. Both were on hand, and are shown in the photo at right. A map of the new trees and their species is on this website. While the planting was accomplished in a single day, caring for the new trees has been an ongoing project. For the next three years, the trees will require watering by volunteers if they are to survive and grow. That presented an initial challenge, as the only sources of "city water" were inside the dog park, and at the spigot on the outside of the swimming pool. Two new field hydrants were added to the field in August and now provide sufficient water. Shown at left is one of the two elm trees planted inside the circular sidewalk area at the south end of the field near 25th Street. It was one of several trees designed to provide shade for the benches there, and may eventually grow to a height of 50 feet. The tree at the far left of the photo is a River Birch, one of seven trees of that species that were also planted for the purpose of providing shade in the sitting area, which is now in full sun most of the day. The green bags around the base of the new trees hold 25 gallons of water, which is the amount that each tree requires each week. Watering is not required during weeks when rainfall totals 1.5 inches. Casey Trees recommends watering from May 1 to October 1. However, the first week of October had no rain, so volunteers plan to water as long as the weather remains dry. Volunteers and donations are welcome for this project. Please see the Funding article on this website. See also the separate photo story on the FFF planting volunteers in action, and the trees they planted. Copyright 2017, Friends of Francis Field.